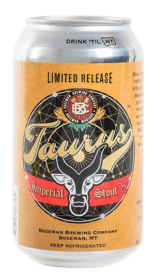 Taurus Imperial Stout is an American beer, it has an alcohol content of 9.5%. Black, mysterious and bold, this beer is crafted with the fortitude and strength of the bull Taurus. Only emerging in the deepest part of winter to shine some light in the darkness and carry us through the cold. Roasted barley and Victory malt provide a strong foundation to support an ample ABV. Tread lightly with Taurus, you know what they say about messing with the bull.